When the clock is ticking on finishing final papers and take-home exams, packing, sorting, and moving out is last on the agenda. Even with that time crunch, donating any unwanted items should be seamless and simple. 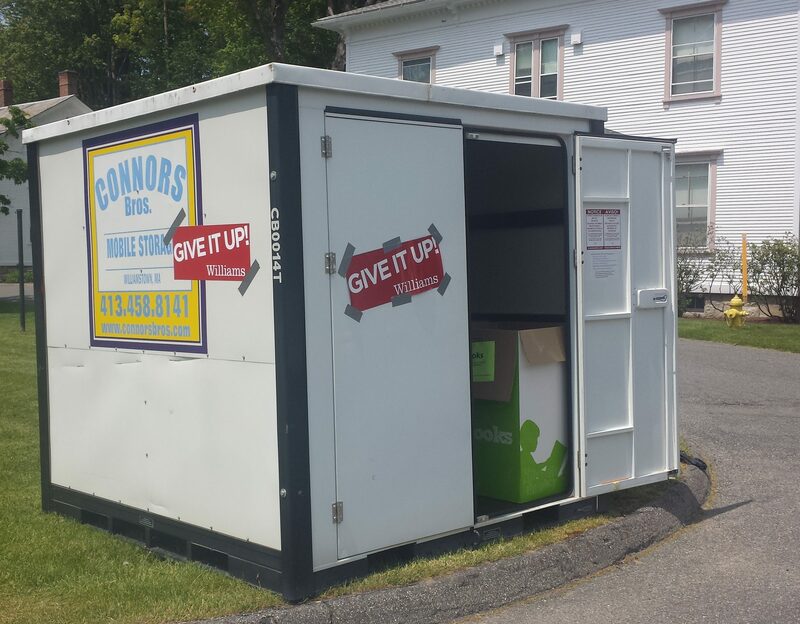 During Spring semester move out, the Give it Up! pods have been that opportunity. This fall we worked on how to continue improving waste reduction efforts during move-out time and increase contributions to Give It Up! Williams has a system to track how much trash goes to the incinerator each week, each month, and each year. We use that data to observe trends, but it doesn’t necessarily clue us in to why those numbers fluctuate. From the data, we know how much more trash goes to the incinerator during May and June every single year. The data show that during the week when underclass students move out, weekly waste volume triples and the week when seniors move out it increases fivefold. In order to zero in on why that is, and how we can both reduce the amount of waste being sent to the incinerator and increase the amount donated to support local organizations, we employed a collaborative design thinking process. Over three sessions this semester, staff from CLiA, the Zilkha Center, Office of Student Life, Facilities, Office of Communications, and Parent and Family Programs, joined students and the Williams “Design Thinker in Residence” to better understand the problem so we could design a solution that truly works for the people most involved in the process. Design Thinking is a process built to encourage creative solutions, and bring in different perspectives to address concerns from each of the groups involved. Rather than assuming the problem had to be solved in the very hectic days around move-out, we considered what could be done during the rest of the year in order to encourage donations well in advance of this last deadline. While the process is ongoing, and solutions are now in the “prioritize” and “prototype” phase, we are excited to have shared in this process as a testing ground for better problem solving methods. To further progress this important initiative, the Zilkha Center is hiring a Give it Up! Intern for the Spring semester. More about the position and the application materials can be found here. As the end of fall semester arrives, you can donate clothes in the bins in Paresky to declutter before you leave for Winter Break.